I’m somewhat recovered from an exhausting week. 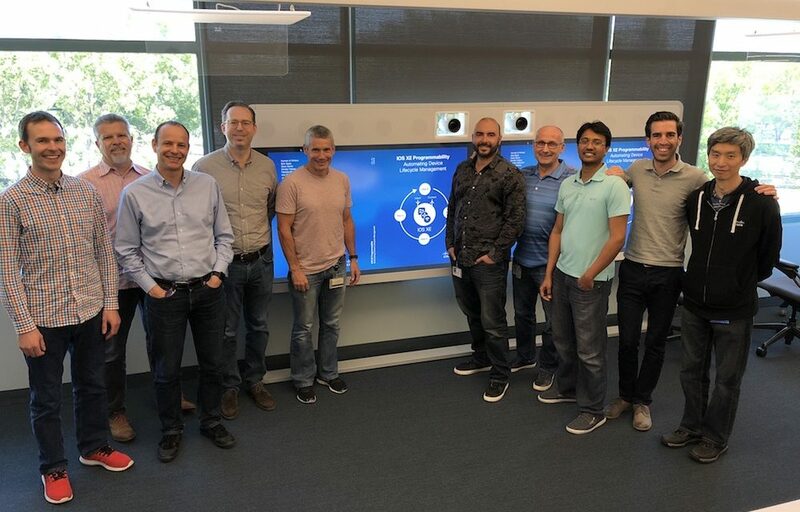 I spent last week with a team of 10 others locked up in building 4 at Cisco writing a book using the book sprint methodology. Several of the TMEs who report to me got together and wrote a book on Software-Defined Access earlier this year. The PDF version of that book is available here. Then, just over a month ago, some TMEs (including one member of my team) got together and wrote a book on the Catalyst 9000-series, available here. Both of these were also produced with the book sprint methodology, and the quality is surprisingly good. These books are written with the help of the Book Sprint company. They send a facilitator who guides the team through writing a book from scratch in a week. There is no preparation beforehand, and almost no work after the week is over. The week begins with everyone writing their ideas on post-its, and then organizing them into the basic structure of the book. By the second half of day one, we were assembled into to small teams to outline our sections. After outlining the section, the sub-teams then break down and individuals start writing the book. By the end of Tuesday, the book is written, but it doesn’t end there. On Wednesday the entire book is reviewed by teams different from the ones that wrote it, and then on Thursday it is reviewed again. Friday the entire book is reviewed by a sub-team to iron out the English and ensure the voice is consistent throughout. While all this is going on, editors and illustrators are working on the book in the background. As I mentioned, it’s exhausting. We worked until midnight on Thursday and 10pm on Friday. But we got it done and we’ll have some copies printed up for Cisco Live in Orlando in June. I can’t say I agree with the approach of every part of the book, but that’s the idea. It’s a team effort. It’s not my book, nor the book of any other team member. It’s our book. I tend to write in a more conversational tone that works for blogs but is not as good for books. I think that my occasionally excessive wordiness helps to draw the reader along, and gives them space to digest what I’m saying. So, it was occasionally painful to see my prose hacked apart by other authors. Still, at the end of the day, the process works and the result was good. For any readers who might be attending CL Orlando, I’ll be happy to sign a copy for you. For those who aren’t, when we have the PDF finalized I’ll link it on the blog. Hi Jeff, have you some news about pdf ? Ah yes, caught up in the post-Cisco Live recovery period. I’ll make a blog entry about it but please go here!